Paul McKeever – Rhonda London Live: Should the Internet be Censored? 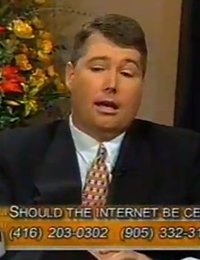 On July 28, 1999, Paul McKeever (Freedom Party of Ontario) was a guest of Rhonda London Live. In this episode, McKeever discussed with host Rhonda London a decision by the CRTC not to regulate the Internet, and the issue of hate speech laws versus free speech. Also a guest on this episode: Sol Littman (Simon Wiesenthal Centre). Featuring: Paul McKeever (Freedom Party of Ontario), Sol Littman (Simon Wiesenthal Centre).